Homemade Paleo Apple Crisp is a healthy and naturally-sweetened dessert. Apples get baked to perfection, creating a soft center with a crunchy, sweet-and-salty nut crust. Everyone will enjoy this healthy apple crisp; so much that you’ll forget it’s healthy. I won’t tell if you even eat it for breakfast! Follow my tips below to make the perfect Paleo apple crisp. 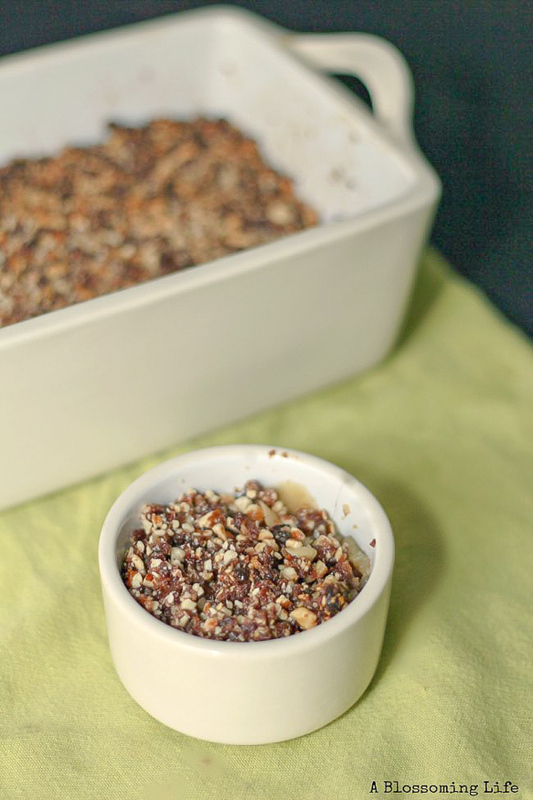 This recipe is grain-free, dairy-free, gluten-free, and refined sugar-free. Even Whole30 queen Melissa Hartwig approves of this recipe for a special Whole30 occasion, like to bring to a holiday party. I love to bake. It’s relaxing, it’s a creative outlet, and the best part is that when you’re done, you have something delicious to eat. Baking is a really great hobby… unless you’re on the Whole30. Starting Whole30 on May 1st began as a last-minute decision. There was no prep work involved, and so, in my mind, I would simply eat eggs for breakfast every day, meat and veggies for meals, and fruit in between. Forget dessert; I was going to break myself of dessert. I was prepared for 30 days of total misery. And besides, May doesn’t really have any major holidays (or so I thought), so this would be the right time to do it! On day 10, appropriately dubbed one of “The Hardest Days” on the Whole30 timeline, I was faced with some amazing local pizza to celebrate my dad’s birthday. Okay, no biggie. I had a nice salad and practiced great self-control. Then, along came the second wave of “The Hardest Days” – day 11. During my Whole30, this day happened to fall on Mother’s Day. My first Mother’s Day, to be clear. To celebrate, my sister baked two lemon meringue pies to enjoy at my parent’s home. Suddenly, my mind could not comprehend why anyone would start a diet that would discriminate against lemon meringue pie. It’s a pie based on fruit and eggs. It’s probably the healthiest pie of them all! The most Whole30-loving pie there ever was. Right?? I watched those pies as my large family heartily dug in, while I pretended not to care one bit. Oh, I cared. But I also stayed true to Whole30, and it was totally worth it. I can say with confidence that I own and practice a monstrous amount of self-control, and I didn’t give in to the lemon meringue pie. However, I was itching to bake and I wanted to celebrate Mother’s Day. So, needless to say, I decided a Whole30 dessert was in order. Although Whole30 might be disappointed in me for this healthy apple crisp, I’m quite at peace with that. Update: Funny story, Melissa Harwig actually linked to this recipe as a perfect Whole30 “dessert” to bring for the holidays… so there is that. The Whole30 queen herself even approves of this healthy dessert. I threw some ingredients together — whatever I had on hand and seemed right at the time — and the result was actually amazing. I didn’t know there was delicious, healthy dessert outside the realms of sticky sugar and flaky crust. I’ve even served this dessert to non-Whole30 people. You know, regular folks. And they loved it! just to name a few. If you don’t have these, any apple that bakes well will do just fine. And if you don’t, I still encourage you to make this with whatever apples you have on hand. Add your favorite nut. 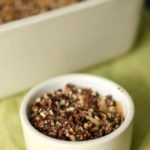 In this recipe I used almonds, but I would definitely be up for trying a few different nuts, or a mixture of different kinds of nuts. If you try it, let me know. To go totally off the rocker, you could absolutely make this into a berry apple crisp by substituting frozen mixed berries for the apples, or do half apples and half berries. The other day, I made it with pears and apples. Delish! Top it with some coconut whipped cream to make it extra delicious. I like using the fat from the full-fat can. Just refrigerate the can of coconut milk, then skim off the fat off the top and whip it up with a stand mixer or hand mixer. If you don’t have raisins, you could swap them out for dates. This recipe is so simple and takes very few ingredients. Because of its simplicity, it doesn’t have any grains or refined sugars, so if you bake for someone who is paleo or gluten-free, then this recipe is perfect for them. If you try this recipe and love it, please come back and give it 5 stars! I will greatly appreciate you and give you a virtual hug. 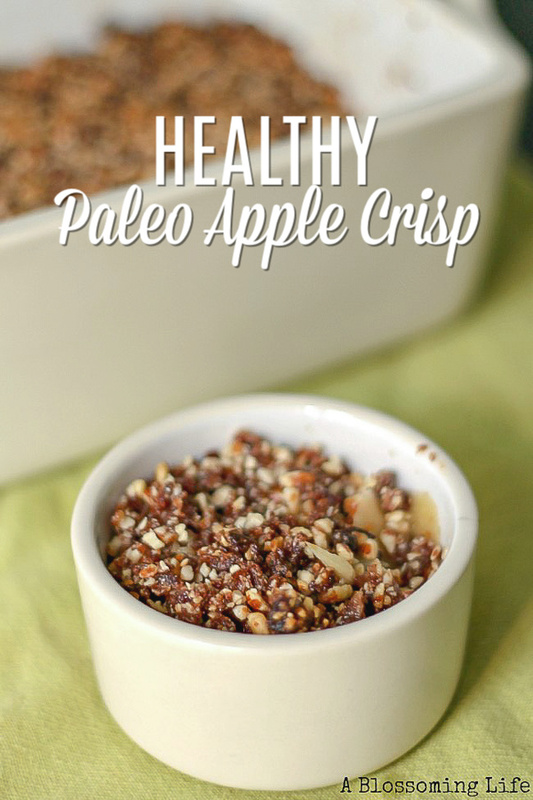 Homemade Paleo Apple Crisp is a healthy and naturally-sweetened dessert. Apples get baked to perfection, creating a soft center with a crunchy, sweet-and-salty nut crust. Everyone will enjoy this healthy apple crisp! 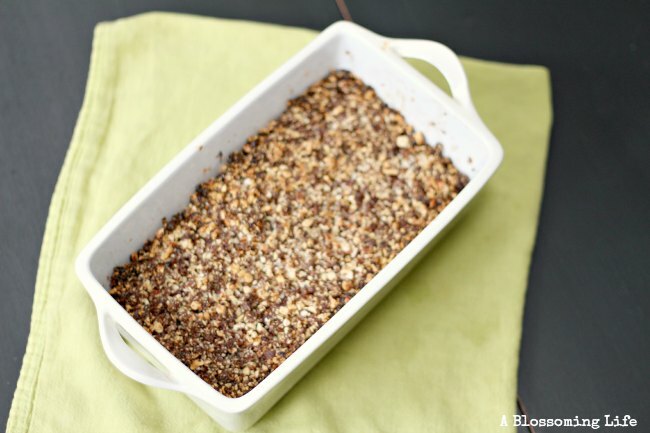 Grease an 8x8 baking dish (or a 1.5 or 2 quart baking dish) with 1 tablespoon of coconut oil. Place the sliced apples in the dish, and add the remaining ingredients to your food processor. Process the mixture until it resembles the texture of coarse sand. Evenly distribute the almond and raisin mixture over the fruit. Cover and bake for 25 minutes, then bake uncovered for another 10 -15 minutes, or until fruit is bubbling and apples are soft. Your almond and raisin topping should darken. Want some other healthy dessert inspirations: Check these out! Yum! Pinning and totally going to make this! This sounds delish, can’t wait to try it! This looks delicious! Question, how do you prepare the coconut cream? Is it whopped coconut milk? Or do you buy the cream (which I found to be more in a paste consistency). I like using the fat from the full fat can. Refrigerating the can, skimming the fat off the top and then whipping it up. I tried the cream and wasn’t a fan… Plus then you have milk to add to your coffee. :). This was a delicious and healthy dessert perfect for Whole30. And go you for doing 3! Making this! Didn’t have raisons but used dates! Excited! I was just curious, how small do you slice the apples and can you bake in advance and reheat or should you bake and consume right away? Please don’t eat this if you’re on a whole30! Totally SWYPO. But I am really looking forward to making this the next time I need a dessert and I’m back to paleo. Melissa Hartwig actuallylinked to this recipe as a good option for someone on Whole30 during Thanksgiving. She admits that it’s borderline SWYPO but said that for Thanksgiving she thinks it would be an ok substitute. I plan to make it so I don’t feel so tempted at dessert time tomorrow! This recipe is amazing and very simple to make. The hardest part is not to eat it all at once! Thank you for sharing it with us!